Fixed vs. 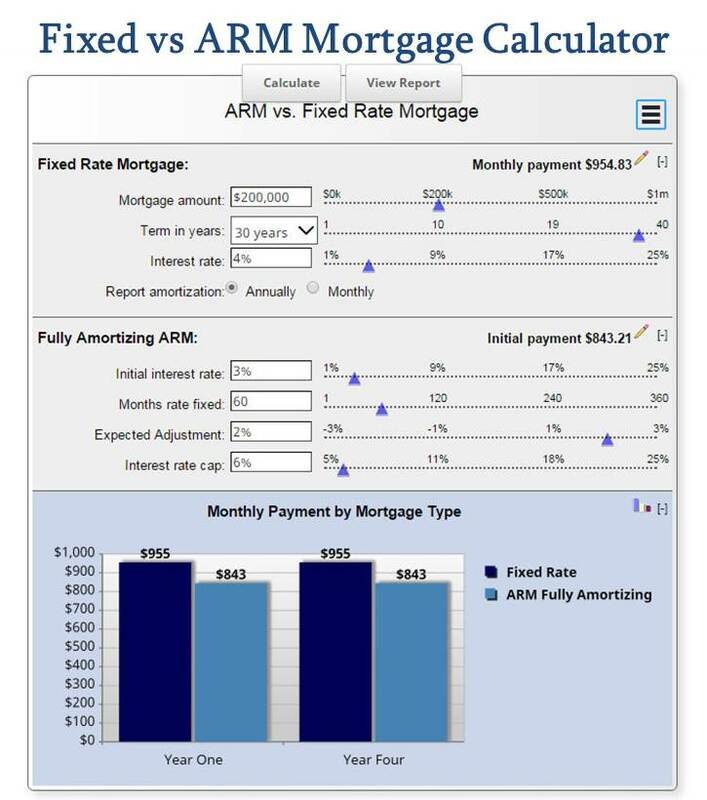 ARM Mortgage Calculator compares a fixed rate mortgage to a fully amortizing ARM. A fixed rate mortgage has the same payment for the entire term of the loan. An adjustable rate mortgage (ARM) has a rate that can change, causing your monthly payment to increase or decrease. Adjustable Rate Mortgage Calculator also calculates the mortgage payment for an adjustable rate mortgage. This Fixed vs. ARM Mortgage Calculator includes an amortization schedule so you are able to view the differences between fixed rate and ARM over the loan term. This Fixed vs. ARM Mortgage Calculator includes a graph to compare year one to year four - view the amortization schedule and more details by clicking on the "View Report" button. You may also email the results by clicking on the three-line icon in the upper right hand corner of this ARM mortgage calculator. Feel free to use current Mortgage Rates in this mortgage calculator. Looking for a different mortgage calculator? More Mortgage Calculators Here.